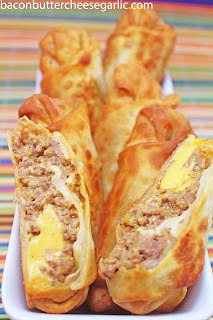 These Cheeseburger Eggrolls are easy to make, fun to eat, and darn tasty! Enjoy! Brown the ground beef with the minced onions in a large skillet. Drain it, if necessary. Stir in half of the Velveeta, the garlic powder, salt & pepper, ketchup, mustard and chopped pickles. Cook and stir until the cheese melts. Remove it from the heat. 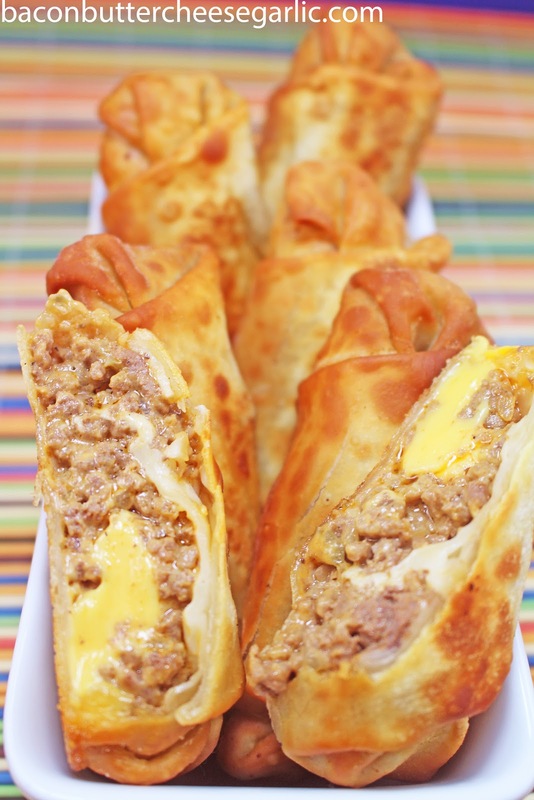 Divide the remaining cheese among the eggroll wrappers. Put about 1 1/2 T of the meat mixture on the wrappers. Roll them up into eggrolls. Freeze the eggrolls for at least 30 minutes to firm them up. Fry the eggrolls in a skillet in the peanut oil until they are browned and crispy. 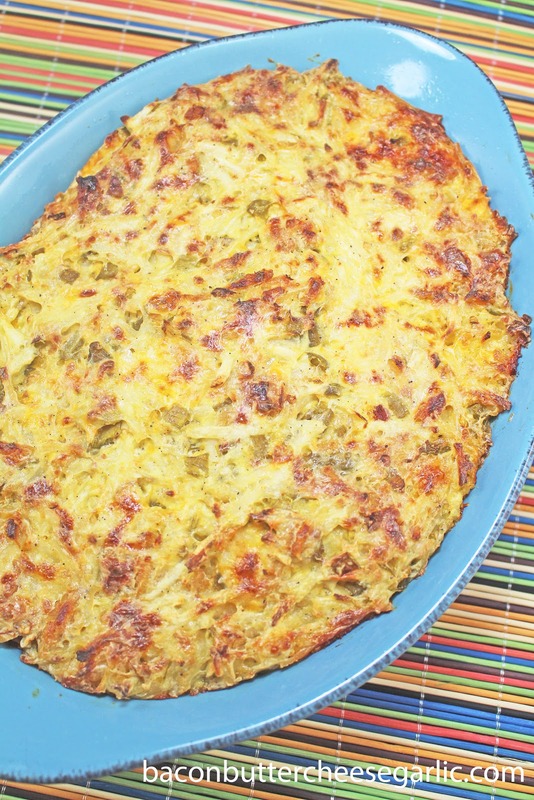 If you are a fan of mild green chilies, creamy potatoes, and cheese, then you are going to love this Green Chili Hashbrown Casserole. While it takes awhile to cook, the prep time is so fast and easy. And you can make it the day before, refrigerate it, and cook it the next day! Enjoy! Preheat the oven to 400 degrees. Mix all of the casserole ingredients together. Spray a 2-quart casserole pan with nonstick spray. Spread the hashbrown mixture into the casserole pan. Bake the casserole covered with foil for 30 minutes. Remove the foil and bake an additional 45 minutes or so or until the potatoes are soft and the top is browned. So we have a new obsession with boneless, skinless chicken thighs. I haven't really used them much except for the last six months or so. But they have so much more flavor and juiciness than chicken breasts. So I wanted to make these Kung Pao Chicken Meatballs with Noodles. My grocery store had boneless, skinless chicken thighs in 3-lb packages, buy one, get one free. We got two packages for around $12, and it was enough for four meals. Great deal! Now, how did I make meatballs with that, you ask? Well, we have a Kitchenaid stand mixer and we have a meat grinder attachment. Don't panic. You don't have to have one. Just go to the meat counter at your grocery store, bring them a package of boneless, skinless chicken thighs, and ask them to grind it for you. They will have it ready by the time you finish your shopping at no charge. Sure, you can buy prepackaged ground chicken, but I don't know whether it's dark or light meat. I also can't tell you what the consistency of these meatballs would be or if you need to add anything to it. But I will tell you that I have made a LOT of meatballs in my life with ground beef, pork, or sausage. But these chicken meatballs were by far the best meatballs to come out of my chicken. And the Kung Pao sauce and noodles with the meatball were darn tasty! Enjoy! NOTES: If you go with the boneless, skinless chicken thighs, your meatballs will be very wet. But that's okay. They stay moist and juicy. If you go with pre-ground chicken, you may want to add an egg or even milk to get the same result. Also, the hot Asian chilies are very hot. Leave them whole for subtle heat. Break them up in the sauce for very hot heat. Or you can leave them out altogether. Preheat the oven to 350 degrees. Mix the meatball ingredients together and shape the meatballs into 1-inch meatballs. Place them in a casserole pan and bake them for 30-35 minutes or until they are done. Meanwhile, cook the pasta according to the package directions. Whisk together the sauce ingredients in a sauce pan. Bring the sauce to a boil and then turn off the heat. 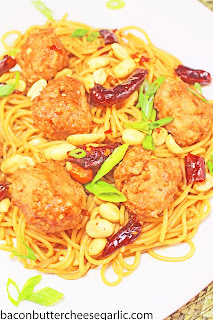 When the meatballs and pasta are done, drain the pasta and add the sauce, meatballs, green onions, and peanuts to the noodles and toss it all together. I love one-skillet meals. They are quicker to make, get on the table faster, and there's a lot less cleanup. When I came across this Tex Mex Skillet Pie, I was a little skeptical. It has sweet potatoes in it. Now, I love sweet potatoes. Don't get me wrong. But I wasn't sure if Tex Mex and sweet potatoes went together. I'm adventurous, though, so I gave it a shot. And you know what? It was great! It was spicy, sweet, and savory all at once. My son came in the kitchen and said, "wow, that looks pretty good." And he was right. We all enjoyed it. So take a chance with a different combination and try this. You'll be glad you did! Preheat the oven to 425 degrees. Drizzle some olive oil in an ovenproof skillet, preferrably cast iron. Cook the onion and the sweet potatoes for about 3-4 minutes, or until the potatoes start to soften. Add in the ground beef and the cumin, chili powder, garlic powder, and salt and pepper to taste. Cook and stir until the ground beef is browned. Remove the skillet from the heat. Add in the corn, RoTel and cilantro and stir. Smooth the beef mixture out evenly. Mix together the cornbread mix, the egg, and the milk. Pour the cornbread mixture over the center of the skillet. You will not have enough cornbread to go all the way to the edges. 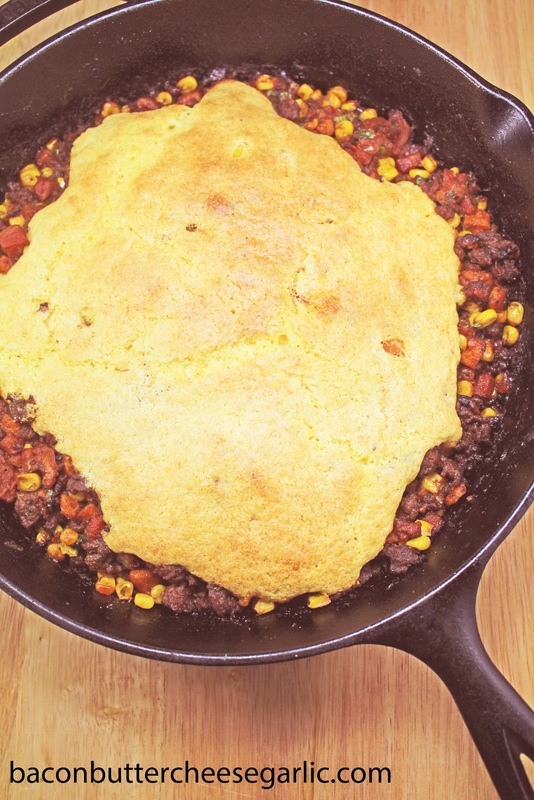 Put the skillet in the oven and bake it for about 15-18 minutes or until the cornbread is done. Serve the pie with sour cream and shredded cheese. My husband is my biggest fan and he loves my cooking. But, every once in a while, I make meals that he calls "chick food," meaning to him it's more appealing to women. Like this recent dish. 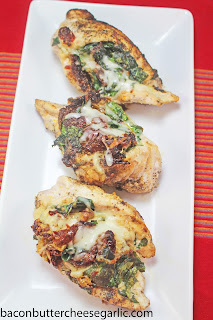 This is Sundried Tomato, Spinach & Cheese Stuffed Chicken. He liked it and ate it, but it's ingredients that women probably like more than men. This dish is pretty easy to make and looks so pretty. 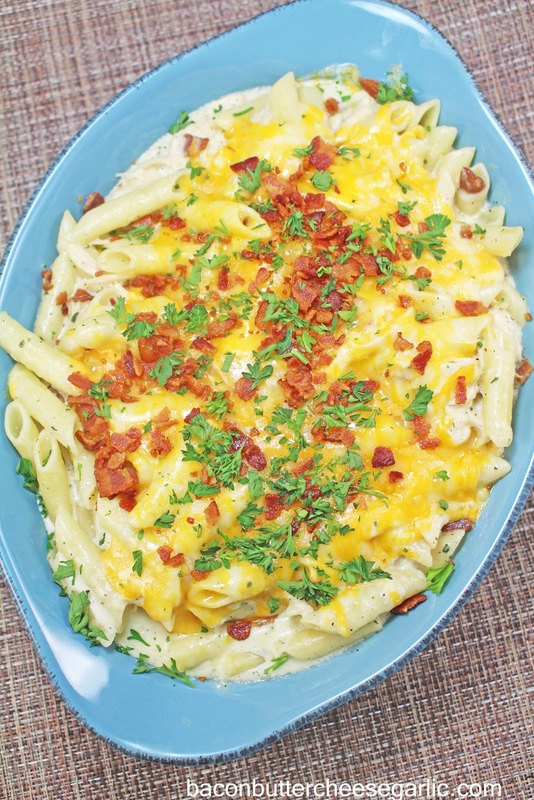 You could really use any cheese you like and you could switch out regular tomatoes for the sundried tomatoes. And you could use kale instead of spinach too. It didn't take too long to cook either, and it was darn tasty! Enjoy! Preheat the oven to 375 degrees. Cut a pocket in each chicken breast, but don't cut them all the way through. Season them inside and out with some seasoned salt, garlic powder, and black pepper. Mix the spinach leaves, Parmesan cheese, Mozzarella, the 1 teaspoon garlic powder, and sundried tomatoes together in a bowl. Stuff the spinach mixture into each of the chicken breast pockets, securing the ends with toothpicks if necessary. Put the chicken stuffing side up in a casserole pan. Bake the chicken for 35-40 minutes or until a thermometer reaches 165 degrees internally in the chicken. My poor daughter and I are outnumbered. Other than the two of us, there are two males in the house and three male dogs. Yes, three. There is a lot of snoring, burping, and other gross boy stuff going on around here. And a lot of hungry boys. My son is 15 and he eats enough to feed at least three people, but he looks like he's borderline starving since he's so thin. And tall. And the dogs all have to be fed separately so they don't fight over food. Roscoe, the puppy, who is only 35 pounds, eats his food in 8 seconds flat. I don't think he chews. Then he tries to eat Cooper's food. Now, Cooper is the big boy in the house. He's a 100-pound Boxer. Cooper isn't about to share his food with anyone. And poor Bentley, who is the oldest dog, has to eat his food in an entirely different room or else he doesn't get any food. Good times. So I made this pasta last night with the human boys in mind. They both like chicken and bacon and Ranch. I combined the Ranch flavors with homemade Alfredo sauce. Yep, you read that right. And it was fantastic! It's actually my most favorite pasta I've made in a long time. And I scaled it back a bit so we didn't have a huge pan with a lot of leftovers. There was some leftover, but I didn't have to pawn it off on coworkers. This was easy to put together and darn tasty. I hope you enjoy it! NOTES: You can use rotisserie chicken here or, as I do, I boil chicken breasts, shred them, and freeze them in smaller portions for occasions like this. Cook the pasta according to package directions. Meanwhile, melt the stick of butter in a pot. Whisk in the heavy cream and garlic. Let it come to a boil. Turn the heat off or down to the lowest setting. Whisk in the Ranch dip mix. Whisk in the Parmesan cheese in small handfuls, making sure it's smooth before adding more and continuing until all the cheese is melted. Stir in black pepper, to taste. Preheat the oven to 350 degrees. Combine the drained pasta, chicken, bacon (save some for the top), and the sauce mixture. Put the pasta in a 2-quart casserole dish. Sprinkle the Cheddar cheese on top. Bake the pasta for about 10-15 minutes to melt the cheese on top. Sprinkle the saved bacon on top and chopped Italian parsley, if desired. 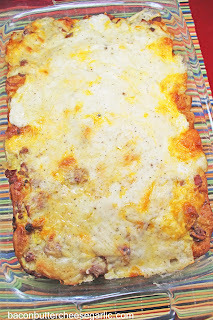 This Biscuits & Gravy Casserole is really pretty easy to put together and tastes fantastic! Our kids loved it, and they aren't really fans of biscuits and gravy. This is more than just biscuits and gravy since it also has the eggs included too. Enjoy! For the gravy, put the bacon grease (or lard or oil) into a skillet over medium high heat. Whisk in the flour until it's smooth. Add in the milk and season the gravy with salt and pepper. Continue whisking and cooking until the gravy starts to bubble. Remove it from the heat. Grease a 9 x 13 casserole pan. Cut each biscuit into four pieces. Spread them out in the casserole pan. Next whisk together the eggs, 1/2 C milk, and season it with salt and pepper. Pour the egg mixture over the biscuits. Next spread the sausage and bacon out over the eggs. Next spread the cheese out over the bacon and sausage. Pour the gravy all over the top, trying to cover all of it. Bake the casserole for about 35-40 minutes or until the biscuits in the center are done. So our daughter will be 18 years old in six days. SIX DAYS! I had the revelation the other day that we successfully raised a child from birth to adulthood with only a few hiccups. I feel like we've made such an accomplishment! And she's about to be an adult, so that means she'll move out soon, right? One person off the payroll! Woo-hoo! Seriously, though, she'll probably be here a few more years, and that's okay. So I've made a lot of baked zitis in my life, and I usually don't stray from the traditional recipe. But I came across a recipe that used breakfast sausage instead of Italian sausage. I thought it sounded interesting, so we gave it a try. And we thought it was fantastic! I'm calling it Sausage Pasta Bake. It was really pretty easy to put together, even with me making my own sauce. 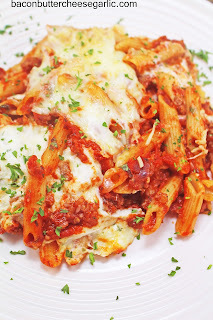 You can use the shortcut of jarred marinara sauce, or you can use my sauce recipe below. It's something that I'm sure we will have a lot. I hope you enjoy it as much as we did! If you are making your own marinara sauce, put all of the sauce ingredients into a pot and whisk. Bring it to a boil. Cover it and reduce the heat to a simmer. Cook for about 20 minutes or until it's thick. Cook the pasta according to package directions. Stir together the Ricotta, Mozarella, Parmesan, garlic powder and the parsley. Set it aside. Preheat the oven to 350 degrees. Drizzle some olive oil into a skillet and cook the onion until it's tender. Add in the sausage and the minced garlic. Cook the sausage, breaking it up as you go, until it's cooked all the way through. Stir the marinara sauce into the sausage mixture. Stir the pasta into the sausage mixture. Pour half of the pasta into a 9 x 13 pan. Using a spoon, put dollops of the Ricotta mixture all over the pasta. Spread the remaining pasta over the Ricotta. Top with the remaining Mozarella cheese. 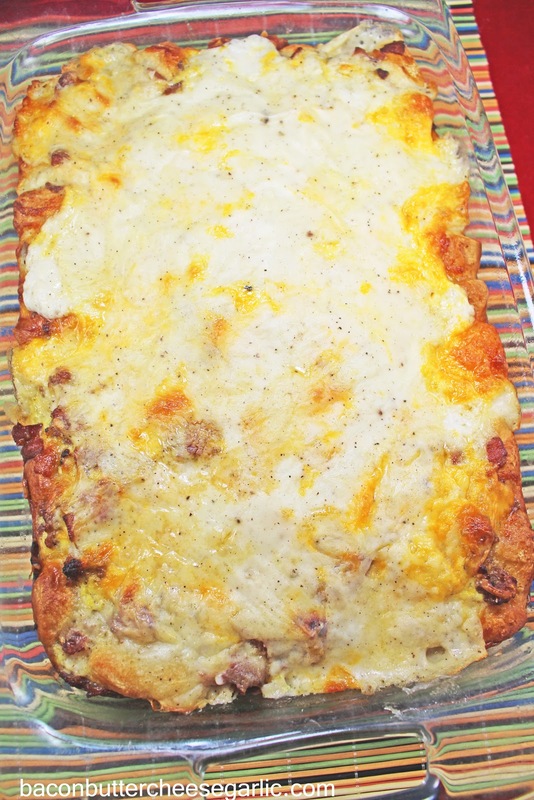 Bake the casserole for about 20-25 minutes or until the pasta is hot and the cheese on top is melted and slightly browned.